Website Pro hosts your clients’ WordPress websites with the most trusted source on the internet—Google Cloud Platform. Our state-of-the-art infrastructure means your sites will always be secure and protected, Google-fast, and scale to fit any business. 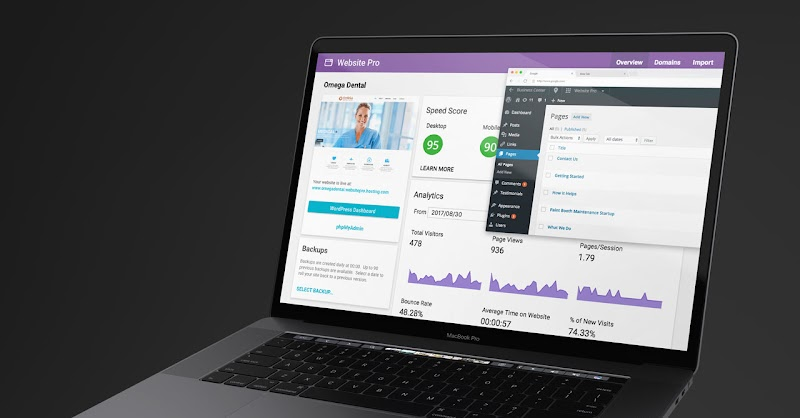 Website Pro brings simplicity back to multi-client web hosting. From one-click site setups, effortless staging environments, and built-in reporting, every workflow is designed to be seamless for agencies. Whether you host a couple of WordPress sites or thousands, Website Pro is the first genuinely easy-to-use solution that makes web hosting fun. World-class security that gives you confidence. With Website Pro you’ll never worry about sites going down, getting hacked, or managing servers again. Gain peace of mind knowing that your clients’ sites are hosted with the most trusted source on the internet—Google Cloud Platform. Your low-maintenance hosting toolkit. Don’t let the technical aspects of web hosting slow you down. Let Website Pro’s suite of developer tools do the heavy lifting so you can stay focused on what makes you money—selling and designing beautiful websites. More than managed WordPress hosting. When you partner with Vendasta, you’ll get access to an end-to-end sales and marketing platform that will help you resell Website Pro hosting and upsell clients into supplementary digital marketing products. 30+ integrated website apps available to resell! No extra charge for daily backups! Looking to migrate? Our team can help at no extra cost. Website Pro leverages the Google Cloud Platform to offer agencies cutting edge scalable infrastructure. Your web hosting infrastructure, server provisioning, and network configurations are managed automatically—so you don’t have to worry about a thing. Host your sites with the best servers in the world and provide sites that are faster and more reliable than the competition. With Website Pro you’ll never worry about sites going down, getting hacked, or managing servers again. Gain peace of mind knowing that your clients’ sites are hosted with the most trusted source on the internet—Google Cloud Platform. Powered by Sucuri, the leader in web security, your clients’ sites will be monitored around the clock for malicious hackers and security breaches. Website Pro only allows HTTPS traffic to our sites, opens the specific ports needed, and uses Google’s firewall to block bot-net IP addresses. One of the most important things you can do to keep your clients’ sites safe from malicious activity is to keep your WordPress core up-to-date. Website Pro takes these updates off your hands and handles them automatically. Every Website Pro site comes with a free Let’s Encrypt SSL certificate. This guarantees your client’s website provides the most secure connection to its visitors. Website Pro does automatic backups of your clients’ sites every day. In the event of a catastrophe, you’ll be able to restore their sites anytime with the click of a button. Thinking of making some big changes to your client’s site? Make a backup before you start with Website Pro’s on-demand backups. With Website Pro, you will never be billed based on the amount of traffic or bandwidth your client’s site uses. We provide every customer with access to the resources they need to build great websites. Your SSD storage is handled by ZFS file server and is run on Google infrastructure. Database storage is run on Google’s CloudSQL fully managed service with databases isolated for each of your client’s site. Don’t let the technical aspects of web hosting slow you down. Let Website Pro’s suite of developer tools do the heavy lifting so you can stay focused on what makes you money—selling and designing beautiful websites for multiple clients. In Website Pro, every WordPress site comes with its own staging environment. That way you can test design changes and plugin, theme, or WordPress updates in a safe place. Workflows should be easy. Once you’re done working on your staging site, push changes and updates to your live site with a single click. With Website Pro’s one-click setup, anyone can set up a site within minutes! Let Website Pro eliminate the technical backend work required to set up your WordPress hosting. Website Pro highlights all changes made since your client’s last backup. This makes it easier than ever to identify what was updated, added, or removed since your last backup. Website Pro comes with phpMyAdmin giving you direct access to your clients’ WordPress databases. Website Pro gives you the flexibility to do any advanced development or analysis work you want. Website Pro makes it easy to develop locally and manage your file system manually. SFTP access provides a secure way to transfer outside sites, templates, or plugins directly into our system. When you partner with Vendasta, you’ll get access to an end-to-end sales and marketing platform that will help you resell Website Pro hosting and upsell clients into supplementary digital marketing products. As part of the Vendasta platform, our WordPress integration is handled through our login system. This means your site will be better protected from password attacks and your user management will be streamlined. We know the point of websites is to generate new customers. That’s why Website Pro adds all contact form fills from your site to your Customer List within the Vendasta platform so you can start marketing to them. 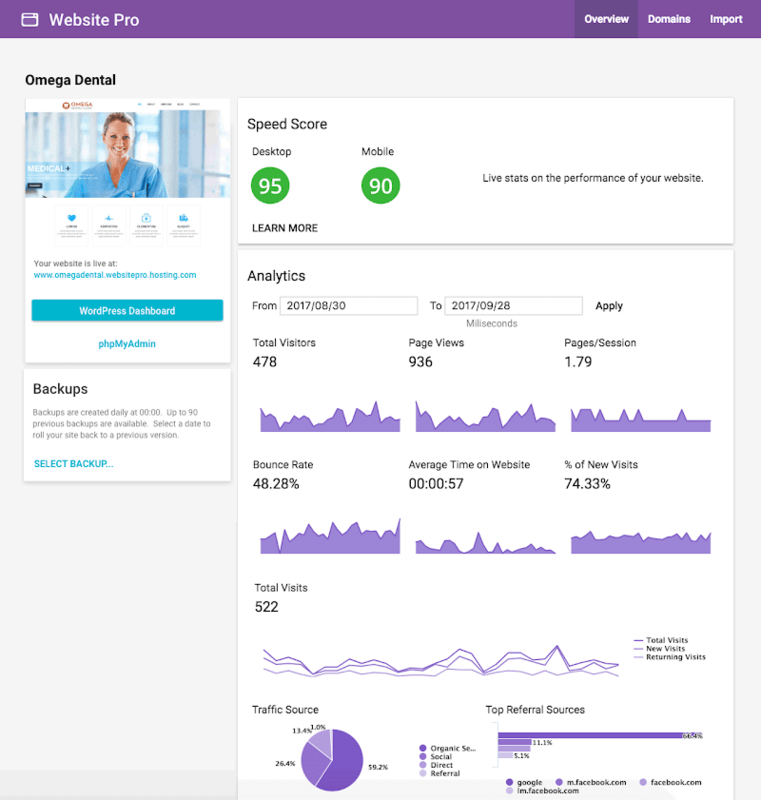 Website Pro comes with a dashboard that shows the highlights of Google Analytics. Give your clients a digestible report so they can stay on top of performance metrics that matter. Give your clients reporting for their website, along with their other products, in a custom Executive Report in Business Center. This all-inclusive report shows your clients what is happening across all digital marketing channels in one place. A widget to make businesses easily accessible to their customers by offering a simple way to connect and start a chat through their website. Offer your clients a way to save 75% of the time they spend managing appointments. Empower your clients to let their customers book appointments online with real-time availabilities and automated reminders. Turn your client’s anonymous website visitors into qualified sales leads with easy tracking and quick reporting. Only about 2% of your clients’ website visitors identify themselves by filling out a form. We’ll help you identify the other 98%. WordPress is the most popular Content Management System (CMS) in the world — powering over 60% of CMS based websites on the internet. It’s highly customizable and easy-to-use, giving developers (and non-developers) the flexibility to build sites of all shapes and sizes. Plus, being Open Source, means there is a community of developers contributing resources, plugins, and themes that anyone can use! Resell WordPress websites under your agency’s brand and price. It’s easy. Create your free account. Build your online store. Generate leads with our automation tools. Start selling.